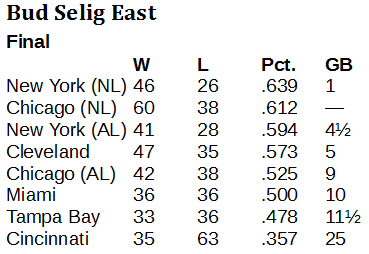 A tight race in the Bud Selig East ended with no clear winner. The title ended in a split between the New York Mets and the Chicago Cubs. The Chicago Cubs and the New York Mets split the Bud Selig East in 2016. For the Cubs, it was something of a repeat, as they won the Bud Selig East in 2015. For the New York Mets, it was something of a first-time championship. But it wasn't fully anything for either club. Half of a championship. The Mets were the easy percentage winners – 46-26 and .639. But the Cubs, at 60-38 and .612, finished one game ahead of the New Yorkers. So, the title is shared. The Mets are the fourth different club to win the title in the league's seven-year history. The Cubs have won twice, the New York Yankees have won twice, the Cleveland Indians have won twice and the Chicago White Sox have won once. The Yankees, who won the American League-only Joe Cronin League in 2016, fared much worse in this regionalized mashing of the Joe Cronin and Chub Feeney Leagues, finishing 4 1/2 games off the pace.